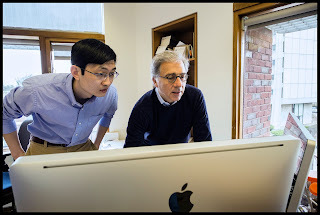 Harvard Stem Cell Institute co-director Doug Melton (r) and postdoc Peng Yi examine images related to their discovery of betatrophin, a new hormone that is a potential treatment for type 2 diabetes. The Harvard Stem Cell Institute (HSCI) have recently discovered a new hormone called betatrophin that can lead to a more effective treatment of type 2 diabetes. In twenty years, diabetes is projected to affect 550 million people all over the world. Currently, it is the number one cause for foot amputations and non-genetic vision impairments. There are two type of diabetes, Type 1 diabetes and Type 2 diabetes. Although both types are caused by lack of insulin, they differ in how this is caused. Type 1 diabetes is mostly genetic and invoves the immune system attacking beta cells which are responsible for producing insulin. Type 2 diabetes is caused by the body rejecting its own insulin or that there is not enough insulin produced by the body. Of the two, 95% of diabetes cases are Type 2 diabetes and the leading cause of Type 2 diabetes is obesity. Insulin is needed by the body to regulate the blood sugar (glucose) levels of the body. Insulin helps in moving glucose from the blood to cells where it is stored for future use as energy. Without insulin or when there is not enough insulin, glucose remains in the bloodstream. At high levels of glucose, blood vessels start to harden and other complications such as kidney failure, heart disease, and other organ malfunctions arise. There is no cure for diabetes. The disease can only be managed through glucose monitoring, insulin injections and other medications that help regulate glucose levels. Researchers at the Harvard Stem Cell Institute (HSCI) have discovered a hormone that holds promise for a dramatically more effective treatment of type 2 diabetes, a metabolic illness afflicting an estimated 26 million Americans. The researchers believe that the hormone might also have a role in treating type 1, or juvenile, diabetes. The work was published today by the journal Cell as an early on-line release. It is scheduled for the May 9 print edition of the journal. "If this could be used in people," said Melton, Harvard's Xander University Professor and co-chair of the University's Department of Stem Cell and Regenerative Biology, "it could eventually mean that instead of taking insulin injections three times a day, you might take an injection of this hormone once a week or once a month, or in the best case maybe even once a year." Type 2 diabetes, a disease associated with the national obesity epidemic, is usually caused by a combination of excess weight and lack of exercise. It causes patients to slowly lose beta cells and the ability to produce adequate insulin. One recent study has estimated that diabetes treatment and complications cost the United States $218 billion annually, or about 10 percent of the nation's entire health bill. "Our idea here is relatively simple," Melton said. "We would provide this hormone, the type 2 diabetic will make more of their own insulin-producing cells, and this will slow down, if not stop, the progression of their diabetes. I've never seen any treatment that causes such an enormous leap in beta cell replication." Though Melton sees betatrophin primarily as a treatment for type 2 diabetes, he believes it might play a role in the treatment of type 1 diabetes as well, perhaps boosting the number of beta cells and slowing the progression of that autoimmune disease when it's first diagnosed. "We've done the work in mice," Melton said, "but of course we're not interested in curing mice of diabetes, and we now know the gene is a human gene. We've cloned the human gene and, moreover, we know that the hormone exists in human plasma; betatrophin definitely exists in humans." While Melton was clear about the need for more research before the hormone could be available as a drug, he also said that betatrophin could be in human clinical trials within three to five years, an extremely short time in the normal course of drug discovery and development. Working with Harvard's Office of Technology Development, Melton and Yi already have a collaborative agreement with Evotec, a German biotech firm that now has 15 scientists working on betatrophin, and the compound has been licensed to Janssen Pharmaceuticals, a Johnson & Johnson company that now, too, has scientists working to move betatrophin toward the clinic. But were it not for the federal funding of basic science research, there would be no betatrophin. A Melton proposal titled "Searching for Genes and Compounds That Cause Beta Cell Replication" impressed National Institutes of Health grant reviewers, and received federal funding for 80 percent of the work leading to the discovery of betatrophin. As is often the case in basic science research, serendipity played a role in the discovery of betatrophin, which Melton and Yi originally called Rabbit because they discovered it during the Chinese Year of the Rabbit, and because it makes beta cells multiply so quickly. For more than 15 years the major focus of Melton's work has been not type 2 diabetes but the less common type 1, or juvenile diabetes, which he began focusing on when his son was diagnosed with it as an infant. (The disease later was also diagnosed in his daughter.) Additionally, most of Melton's work has involved using stem cells, the fundamental building blocks of all human organs, as disease treatments and targets for drug discoveries. But stem cells played no direct role in the discovery of betatrophin. It was, rather, a classic example of scientists with sufficient resources asking questions, and pursuing answers, that fell outside the usual scope of their laboratories and institutes. "I would like to tell you this discovery came from deep thinking and we knew we would find this, but it was more a bit of luck," explained Melton, who in addition to his roles at Harvard is a Howard Hughes Medical Institute investigator. "We were just wondering what happens when an animal doesn't have enough insulin. We were lucky to find this new gene that had largely gone unnoticed before. "Another hint came from studying something that people know about but don't think much about, which is: What happens during pregnancy?" he said, "When a woman gets pregnant, her carbohydrate load, her call for insulin, can increase an enormous amount because of the weight and nutrition needs of the fetus. During pregnancy, there are more beta cells needed, and it turns out that this hormone goes up during pregnancy. We looked in pregnant mice and found that when the animal becomes pregnant this hormone is turned on to make more beta cells." Melton and Yi have been working on the project for more than four years. But the big breakthrough came on Feb. 10, 2011. "I was just sitting there at the microscope looking at all these replicating beta cells," said Yi, and he could barely believe his eyes. He said he never had "seen this kind of dramatic replication." At first unsure whether to repeat the experiment or to tell Melton right away, Peng said he rushed into Melton's office, printed out the image he was seeing, and showed it to Melton, telling him they probably had a breakthrough. "I showed him this picture and told him this is a secreted protein, and he was really, really excited about this result." "I remember this very well," Melton recalled. "It's a black-and-white picture where you're looking at a section, like a section through a sausage, of the whole pancreas. When you normally look at a black-and-white picture of that, it's very hard to tell where the beta cells are, the insulin cells. "But in this test," he continued, "any cell that was dividing would shine up bright and white, like a sparkle. He showed me this picture where the whole pancreas is largely black, but then there were these clusters, like stars of these white dots, which turned out to be all over the islets, the place where the beta cell sits. I still keep that black-and-white picture. We have much fancier color ones, but I like the black-and-white picture, because it's one of those moments when you know something interesting has happened. This is not by accident. I've never seen any treatment that causes such an enormous leap … in beta cell replication." "Dear Peng, I can hardly sleep — I am so excited by your result. It's a tribute to your hard work and hard thinking. Can't wait to see the data from the repeat. Doug."